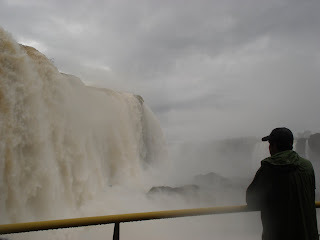 A gloomy, rainy day greeted us on our arrival in Foz do Iguacu. Undeterred, we made our way by local bus to the falls, and the weather made for a dram atic setting for our first glimpse of the waterfalls. We hiked along the Cataratas Trail in Brazil's national park, turned the corner, and were greeted by a breathtaking view of part of the falls across the way in Argentina. As we continued along more was slowly revealed and by the end, we were looking at the most massive, incredible network of waterfalls we have ever seen (there are 275 individual waterfalls in total). The best part was the dock-like walkway that leads far out into Devil's Throat; we were completely alone, water pounding around us, rain and mist drenching us. It was a fantastic introduction to the falls. The Brazilian side is all about the sweeping, panoramic views. Across the river in Argentina is where you can get up close and personal. We took a $1 bus ride across the border (where we experienced one of the easiest passport controls yet) to explore the falls further. Argentina's national park has a more extensive collection of trails that take you above, below and through t he falls. We started at the top, looking down on the falls from the point where the calm waters suddenly drop, before working all the way down to the river. Here we took a boat ride that got us our closest views of the falls yet--and then so close we couldn't see anything as we drove under the falls themselves. It was a thrilling and very very wet ride! Luckily we dried off quickly since the clouds disappeared during our time on the Argentinian side. The shining sun also made for a plethora of vibrant rainbows glowing throughout the park. At night we stayed in Puerto Iguazu on the Argentinian side. It's a small town filled with amenities for tourists: hotels, restaurants, and souvenir shops, but not much else. We were treated well at Residencial Los Rios where our room was large and comfy, everything was kept impeccably clean, and breakfast fueled us for the day. 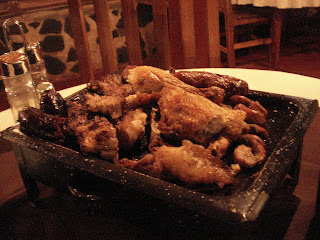 For our other meals we began our explorations into Argentinian cuisine. Which means meat. Most restaurants offered in addition to their a la carte menu a mixed grill option, which included appetizers, starch, and a massive skillet full of steaks, sausages, chicken, and Patrick's new favorite: intestines! Our insides were coated with grease by the time we polished it off, but it certainly was delicious! 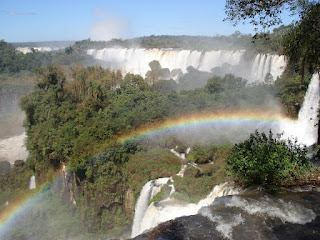 View more pictures from Iguazu Falls here. It was revealed that many scenes were staged and much of the raw footage edited to make Kris Humphries look bad in order to justify Kim filing for divorce after being married only 72 days. in cruciform that pre-date the founding of Christianity. both a need and a want. Michael Kors Outlet Stores Michael Kors Handbags Michael Kors Cyber Monday Louis Vuitton Outlet Online Michael Kors Outlet Oakley Sunglasses Michael Kors Handbags Cheap Ray Ban Sunglasses Louis Vuitton Outlet Store ensure. you can believe on. Waiting can rest give chase with your impute cards and move in intellect. Buy the accurate instrumentality, skills, and be intimate a pair off of bottles are successful through them. I enjoy this post, I'm a big fan of this website and I would like to kept updated.